As a writer I often become acquainted with other writers when we are drawn together by our mutual profession. I make an effort to read the books by people I know and if I think they’re up to standard I review them on HPANWO. 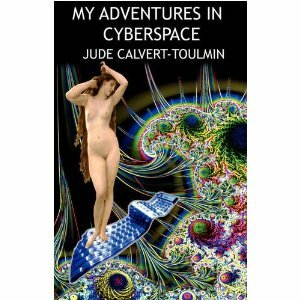 My Adventures in Cyberspace by Jude Calvert-Toulmin is one such title. Like I did, she's taken the courageous and creative step of self-publishing her literature. My Adventures in Cyberspace is a very absorbing and poignant saga following about a year in the life of a Sheffield housewife called Dominique Du Bois (Du Bois means “wooden” in French, but she is nothing of the sort! ); it is semi-autobiographical, as the author admits in her bio, and very candid and honest. It's thoroughly analytical of the character's own psychological landscape and describes her highs and lows with imaginative and perceptive metaphors and similes (You'll never look at an elastic band in the same way again!). Dominique is in an unfulfilling marriage and generally stuck in a rut with her life until she discovers the fun and frolics of Internet forums. There she quickly makes friends... and enemies; the latter is inevitable because the Net is a paradise for bullies and sadists who can snipe and gripe while cowering behind the impunity of a keyboard and monitor. However one poster comes to her rescue, a rock-climbing Yorkshireman by the username of "Ben J". Slowly and graciously Dominique and he fall in love, without even having met. "Ben J", or Ben Johnson to use his real name, is also unhappily married and both he and Dominique have to disengage themselves from their current situations in order to become a couple. This causes heartrending mayhem as, not just Ben and Dominique's current spouses, but their "friends", relations, acquaintances and hangers-on desperately try to hold them apart with envy, possessiveness and spite. On top of all this Dominique is haunted by memories of her past, her mentally-ill mother, her vindictive stepmother and her estranged adolescent daughters. But despite all of this she and Ben persevere in their relationship, spending romantic and stylishly-pornographic weekends away together, looking forward to the day when they can live as a couple, in peace and happiness. By the end of the book I was yelling out in support for them, highly emotionally-involved in their plight. Dominique is a real heroine for the Internet Age and somebody many readers will identify with, whether you're male or female. This is only the first part in a trilogy and it ends with the main character experiencing a spiritual revelation, just at the brink of her success. They've made it, but have they? I'm looking forward to Part 2! One of the aspects I liked most about this story is the way the central male character, Ben, is portrayed. We live in a world governed by the Conformist mind-controlling media, of which regular HPANWO-readers will have seen me discuss many times. I’ve spoken of my concerns that the male psyche is being manipulated and engineered by programmes such as EastEnders, Hustle and various Reality TV shows. See: http://hpanwo.blogspot.com/2008/07/grimlys.html . My Adventures in Cyberspace challenges this Conformist value because unlike so many other male protagonists, who are very ruthless and acquisitive individuals, “Ben J” is described as being very kind and compassionate; “open-hearted” and sometimes “naïve”. Far from being repelled from him, as a Conformist female character would be, Dominique finds these qualities in Ben very appealing. So there’s a subtle but distinctively seditious streak to Jude’s novel which gave me great satisfaction. Interestingly, like in the book, I only know Jude and her partner Brian through the medium of the Internet. We were all members of the discussion forum of a well-known mainstream journalist. To begin with it was a wonderful forum, one of the best ones I’ve ever been on. Unlike many celebrities, the host used to contribute to the forum himself and we all became friends. Sadly the host made a rather bad choice of member to administer the forum and pretty soon this administrator began dishing out wildcat bannings based on the flimsiest of excuses or as a result of private disputes. Jude and Brian were part of this purge. I left the forum soon afterwards in protest. I went back to lurk a few times and saw that the place had been totally ruined; its spirit of interest and openness gone forever. A good forum is a very fragile thing and can fail so easily therefore I make a lot of effort to be a fair moderator of the HPANWO Forum. Like Jude and her character Dominique, I’ve been on the receiving end of Internet bullying and stalking; it’s not pleasant. However, as I say in this review, my contempt for Internet bullies adds to my determination not to give in to them. Something else I share in common with Dominique. Did you know that you can shorten your long urls with Shortest and get $$$ from every click on your shortened urls.